Hello there, REIPro Family! We’re here to announce some very exciting changes to our already incredible Real Estate Investing Automation Software. Now, REIPro is already packed with more relevant, time-saving features than any other Investing software on the PLANET, but there’s a difference between being THE best and being OUR best! We made a promise to ourselves and you, our users, in the very beginning development stages, that we would continually improve and never waiver in our pursuit of excellence. REIPro is centered around two constantly evolving fields – Real Estate and Technology, so it only makes sense that our software should, too. 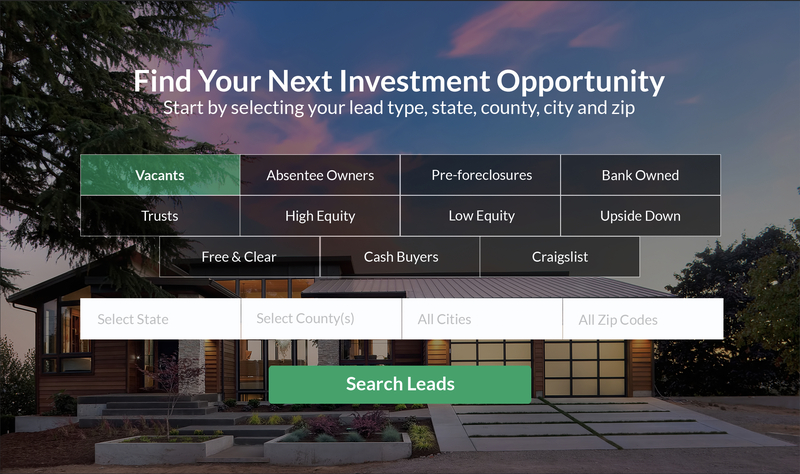 So, we are very proud to be able to bring you the addition of LEADPro VACANT LEADS. Traditionally, Investors had to spend long hours driving neighborhoods looking for houses that appeared to be vacant or hire birddogs to do the work for them. Not only is this time consuming, expensive work, but it’s unreliable at best, and thousands of potential investment deals slip right through your fingers. NOT ANYMORE. LEADPro Vacant Leads is engineered to unearth those hidden gems and deliver them to your screen in seconds. With any of these, they might not have the money or time to make repairs needed to sell it. Either way, they’re paying taxes, insurance and at least minimum upkeep. This kind of motivated seller is usually easier to work with and open to multiple ways to sell. This is the kind of lead that most often takes a potential problem for someone and turns into a deal. Vacant Leads Search comes to you on January 31st so get ready and start putting deals together.